It’s Thanksgiving weekend in the United States. This is a special time of the year when families and friends gather to share a meal and reflect on why they are thankful. Kathy and I have so much for which to be grateful; and especially this year, as so many wonderful things have happened. To be honest, we have more to be thankful for than we probably deserve. There are so many people in the world who do not have love and support from their family members or friends; do not have the resources to travel and move about; do not have food or fresh water readily available; do not have the freedom to attend schools or receive an education; do not have the freedom to worship in public; do not have the physical ability to manage for themselves; do not have the confidence or ability to change their personal situations. The nature of life for many in the world is one of hardship and despair, even in a land as prosperous as the United States. That’s one of the reasons why Lionism is so desperately needed and why we can never stop trying to do what we can to help others in need, no matter how hard it might seem or what obstacles are in the way. Those who are thankful have an obligation to those who have not. For many of us, it’s easy to take things for granted and accept what we have as entitlement. However, Kathy and I are very aware of how fortunate we are and we want all those who read this blog to know that we are so thankful and appreciative for the love and support of our family, friends, co-workers, and community. We know that we could not have enjoyed any of the wonderful things that have happened to us this year without all of you. We hope we show you our thankfulness every time we meet. Showing thankfulness is the real calling of a Lion. We show our thankfulness by how we go about our lives and what we do with what we have. Kathy and I are using our abilities and enthusiasm to convey the spirit of Lionism to everyone we meet. It is hard for us to believe that we are nearly one quarter of the way through our two-year term, so we are doing our best to make every minute count. This past week, I had the opportunity to attend the National Communication Association convention in Chicago, IL. 2014 is the centennial year for the NCA, founded in Chicago in 1914 by a handful of public speaking professors who believed that there was a need for a discipline to encompass the field of speech and communication. 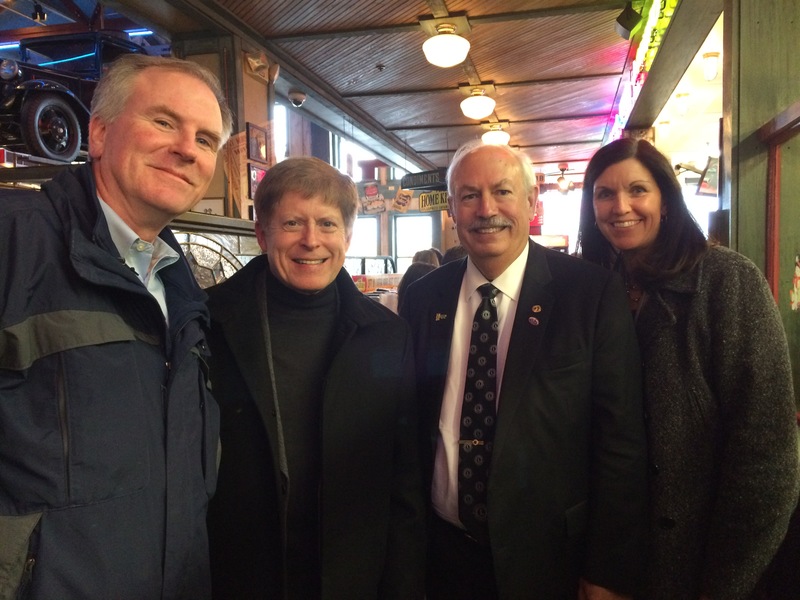 While in Chicago, I took some time to stop by the Lions International Headquarters to meet with several division heads–Patti Repenn-Volante, Leadership; Dane LaJoye, Public Relations; David Clifford, Membership–and had a great unexpected opportunity to spend some time in conversation with our 2nd International Vice President Bob Corlew. 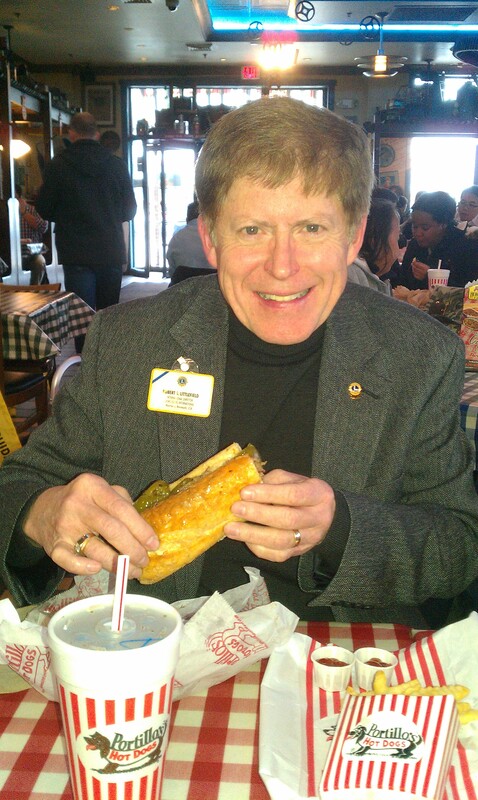 Patti arranged for us to enjoy our lunchtime at Portillo’s near headquarters, so VP Bob drove the van and we enjoyed the atmosphere, the food, and each other’s company. Spending time with these exceptional Lions in a less-hectic environment was great. They are always willing to listen to ideas and perspectives about how to increase membership and develop leadership opportunities. Being able to share some of my thoughts about how to reach out to young people to promote leadership and service, and gaining their insight and experience, was very helpful. I even had time to enjoy my sandwich! Upon my return from the NCA convention where I presented an academic paper on community resiliency and attended meetings related to my position as the editor of Communication Studies, I picked up Kathy and we were off to the Multiple District 5 Council of Governors’ meeting in Minot, North Dakota. We always enjoy coming back to our Multiple District because of the friends we have waiting to greet us. Both Kathy and I had many opportunities to talk about our experiences and we were able to step back and watch the next generation of Multiple District Lion leaders gain knowledge and confidence in their ability to move into their future leadership roles. 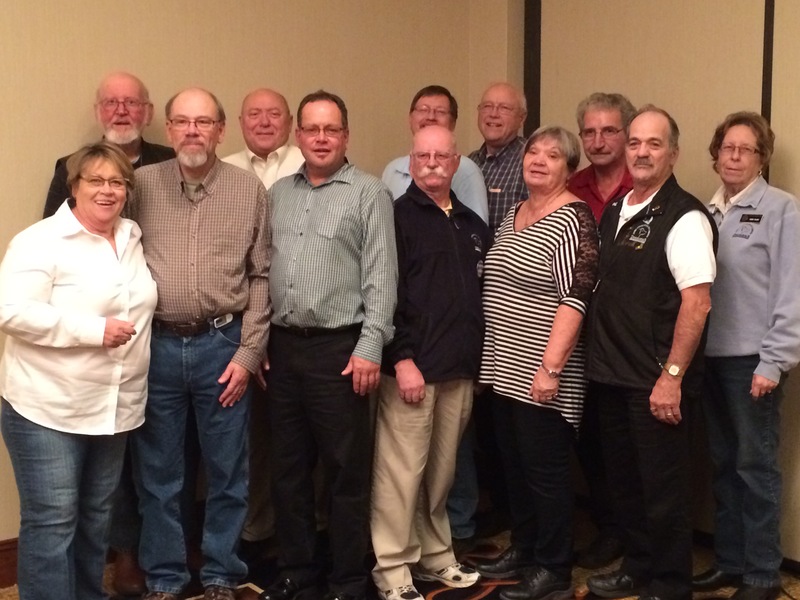 The photo includes District Governor Elects and 1st Vice District Governor Elects from North Dakota, South Dakota, and Saskatchewan (plus their Trainer and Mentor PCC Leo Grossman, 3rd from the right). As Kathy and I returned to Fargo-Moorhead after the meeting, our conversation turned toward Thanksgiving and all that we have been given by the grace of God. 2014 is a year we will always remember.